Maybe you’ve thought about riding a bike in winter? Go for it this year! There are lots of winter cycling enthusiasts near and far to help you with tips. Be part of the culture shift and extend your cycling habits. And the forecast says: Cleared conditions for riding your bike on the new bike grids this winter! 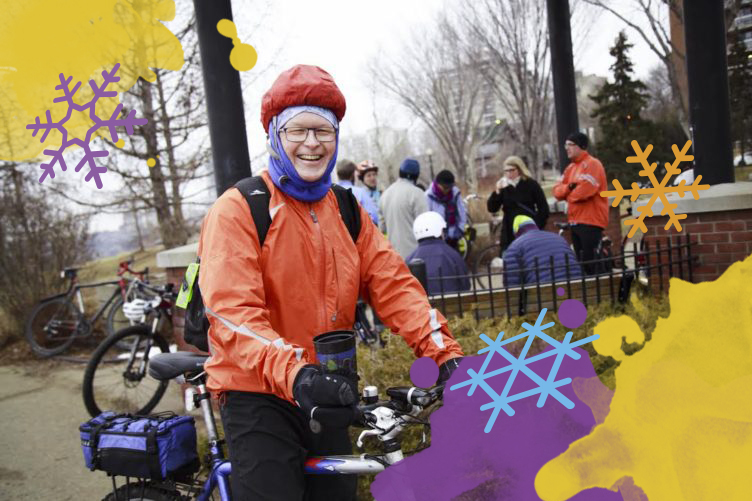 Visit the City’s website to find practical tips as well as dates for winter cycling workshops to Keep Rolling When It’s Snowing. Not sure how to use the new bike lanes? Request a Ride Along led by members of the City of Edmonton’s Bike Education Street Team. These tours are interactive and will include demos of the various features along the new bike routes. Ride Alongs are typically around 1-1.5 hours long and can accommodate 1-30 people. Advice on Winter Biking: Just Do It! For inspiration and practical advice, check out our April 24, 2016 blog about local winter cyclists Molly, Karen, and Glenn. Advice on Winter Biking: Just Do It! Bike Edmonton (Formerly Edmonton Bicycle Commuters Society) runs BikeWorks North and South, where you can learn how to repair your own bike and use their workshop and tools. They also offer lots of bike-related events across the city, including rides, courses, films, sales, and other events on our calendar. Watch the website for winter cycling courses! You can follow them on Facebook and Twitter, too. Paths for People is a YEG-based non-profit dedicated to better infrastructure for people on bikes and on foot. Walk. Bike. Live. Follow them on Facebook, Twitter and Instagram. Ride your bike in the morning? Be part of the coolest coffee club and connect with others over lively conversation. This group meets Friday mornings, usually at Ezio Faraone Park on the north side of the High Level Bridge. Check the Twitter account @coffee_outside for details. And BYO coffee, tea, or hot chocolate. The Winter Cycling Federation’s vision is ‘winter cycling for everyone’, and their mission is to create opportunities for inspiration, research and collaboration. They help cities and countries around the world learn what it takes to develop, implement and maintain bicycle-focused transportation systems year-round. The 7th annual Winter Cycling Congress will be in Calgary, February 6-8, 2019. Will we see you there? !